Envy you your sawmill. We have a lot of trees oaks and pines on the property. Would have been great to have had a opportunity to use some of that in lumber. But we do have a copious amount of firewood stacked. Be safe in the storm and let us know you are both safe along with the rest of the crew. 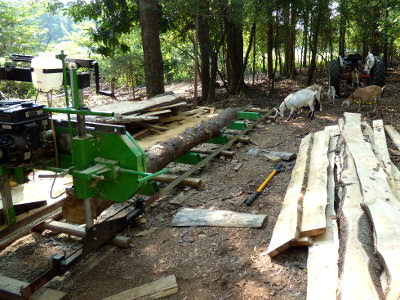 If I had a sawmill set up in my back yard, I would end up with a building made from solid oak since so many of them died a few years back due to stress and oak wilt disease. Thanks Goatldi! It's so nice having a lot of trees available. We are forecast to have 40 MPH winds from Irma this afternoon, so I'm guessing we'll have a number more pine trees topple. Good thinking! 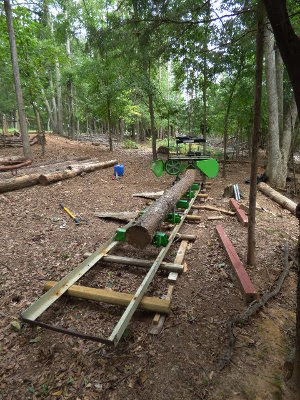 That is one great sawmill. I hope you don't get too much wind - some downed trees are one thing, a whole bunch is another. Hoping you don't sustain too much damage. Leigh, I hope Irma is kind to you. We got home to a mess but the house is still standing. No power and a tree at the widowmaker stage in the backyard, but it could have been much worse if she'd hit us as a cat 4/5 as predicted. God is good! Susan, it's still raining this morning doesn't seem as windy, so after it gets light we'll have a better idea. Lots of downed branches in the yard yesterday, but it was way too windy to venture into the woods. I was able to keep an eye on the sawmill from the goat barn and know it's safe. Only lost power for a short time yesterday, so I think we've done pretty well! Caroline, I am so glad things weren't worse for you! Hopefully you'll have power back soon. Isn't it nice to move things into their best location? Looking at your master plan, you have such a nice set-up. Good work! I know all that hauling is really hard work. M.K. yes, and sometimes it's interesting finding that best location. The master plan took a lot of thought and discussion, I think because of the odd shape of our land. We're still fine tuning! One of these days I'll share an updated one. 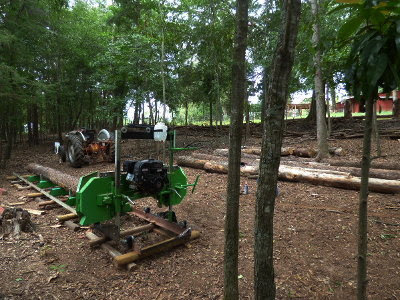 A sawmill. My husband would give his kingdom for one. How we hate traveling 45 minutes for substandard lumber at Menards but for now, it's what we do when not repurposing all that we can. At least here we can burn all the smaller wood in our rocket mass stove. Feels productive in winter time. Donna that sawmill has so been worth the investment. It's already paid for itself! And the lumber is such better quality than the big box store, even if it is untreated.